Amanda Joy Michalka (/miːˈʃɑːkə/ mee-SHAH-kah; born April 10, 1991) is an American actress, singer-songwriter, and musician. She was a model before becoming an actress, and is best known as one-half of the duo Aly and AJ (formerly 78Violet) with her sister Aly Michalka. AJ recorded the theme song and accompanying music video for the film Secretariat, titled "It's Who You Are". She also issued a single and video called "All I've Ever Needed" from her 2013 film Grace Unplugged. She has also had a successful acting career, and after two seasons in a recurring role as Lainey Lewis on the ABC sitcom The Goldbergs, she had been promoted to a regular role on the series for the third season. However, Michalka was demoted to recurring status for the fifth season as her character went to college and thus was in fewer story-lines. She stars with her Goldbergs colleagues Tim Meadows and Bryan Callen in a spin-off Schooled airing since January 2019. Michalka also has a lead role in the critically acclaimed Netflix series She-Ra and the Princesses of Power, in which she voices Catra, the former best friend and current rival to She-Ra. Michalka was born and raised in Torrance, California and is the younger sister of actress and musician, Aly Michalka. Her father, Mark, owns a contracting company, and her mother, Carrie, is a musician and performed with the Christian rock band "JC Band". Her parents are divorced. As a little girl, she briefly lived in Seattle and Milwaukee. Both she and her sister attended Mack Elementary. She has been playing the piano since she was six and started playing the guitar in her early life. She started acting when she was five years old, mostly in church play productions. She was raised as a Christian, and was homeschooled for part of her childhood. Michalka was in a number of musical productions at her school in Milwaukee as a young woman. Her ancestry is German, English, Irish, Scottish, and Welsh. 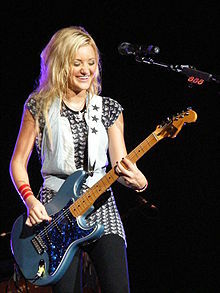 She plays a variety of instruments such as acoustic guitar, electric guitar, and piano. She was a model for catalogs. In March 2006, she made her Disney Channel debut in the Disney Channel Original Movie Cow Belles, as "Courtney Callum," along with sister Aly, as "Taylor Callum." She has also made appearances on shows such as Oliver Beene, Six Feet Under, The Guardian, and General Hospital. She has also appeared with her sister, Aly, in the MTV film, Super Sweet 16: The Movie. In 2009, she was featured in the Peter Jackson film The Lovely Bones, released widely on January 15, 2010. From 2009 until 2013, Michalka and her sister performed as the musical duo 78violet. They decided to later change their name back to "Aly and AJ" in 2015. She was cast as a recurring character on The CW series Hellcats starring Ashley Tisdale and along with her sister Aly Michalka. The series ran for one season and was cancelled in May 2011. Michalka appeared in the 2011 film Super 8, directed by J. J. Abrams. Her first big-screen starring role is as the title character in 2013's Grace Unplugged. Since 2013, Michalka has had a recurring role on the ABC sitcom, The Goldbergs, as Lainey Lewis, the girlfriend of one of the main characters on the show. In May 2015, it was announced that she would be a series regular for the show's upcoming third season. In July 2014, she and her sister, Aly Michalka, filmed an untitled drama in Laurel Canyon, California. The film was directed and written by Aly's husband, Stephen Ringer. Michalka was one of the producers of the film, alongside her sister and Ringer, and also participated in the casting process. In early May 2015, it was announced the film, now titled, Weepah Way for Now, premiered at the Los Angeles Film Festival on June 16, 2015. The film was later released on DVD, iTunes, and other streaming platforms in June 2016. 2002 Birds of Prey Young Dinah Lance Episode: "Pilot"
2014 Silicon Valley Charlotte Episode: "Proof of Concept"
2014 Motive Emily Williams Episode: "Dead End"
^ Semigran, Aly (August 14, 2009). "Aly Michalka, actor and musician". Entertainment Weekly. ^ "Family Tree Legends". Family Tree Legends. Retrieved May 11, 2010. ^ "She-Ra gets a makeover! A first look at the new Netflix series and meet the cast". Entertainment Weekly. Retrieved May 18, 2018. ^ Axson, Scooby (July 7, 2006). "Article: Pop sisters: Better known for their acting, Aly and AJ leap onto music... | AccessMyLibrary – Promoting library advocacy". AccessMyLibrary. Retrieved May 11, 2010. ^ "Tweenage Riot". Blender Magazine. May 23, 2006. Archived from the original on June 28, 2010. Retrieved September 24, 2010. ^ "78 Violet, 11/05 – Interviews – Christian Music Today". Christianitytoday.com. Retrieved May 11, 2010. ^ a b c "Tweenage Riot Article on Blender". Blender.com. May 23, 2006. Archived from the original on December 18, 2008. Retrieved November 10, 2010. ^ "AJ Michalka - TMZ.com". TMZ. ^ Argyrakis, Andy (November 14, 2005). "Away from the Rush". Christianity Today. Retrieved May 11, 2010. ^ Graff, Gary (January 10, 2008). "Aly & AJ Writing New Songs, Plot Films". Billboard. Brightspot. Retrieved February 17, 2019. ^ Valiente, Maria (January 20, 2011). "Hellcats Star Aly Michalka Reveals AJ's Character's Name!". Wetpaint.com. Archived from the original on March 18, 2012. Retrieved March 28, 2012. ^ Goldberg, Lesley (May 18, 2015). "'The Goldbergs' Promotes AJ Michalka to Series Regular". Hollywood Reporter. Retrieved June 7, 2015. ^ Kilday, Gregg (May 5, 2015). "Los Angeles Film Festival Unveils Lineup". Hollywood Reporter. Retrieved June 7, 2015. Wikimedia Commons has media related to AJ Michalka.